For quite some time now I have been wanting internet access on my cell phone, but I didn't want to increase my monthly bill by another $30. 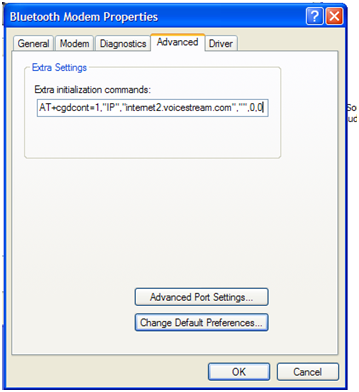 When I originally got my new cell phone, the T-Mobile MDA, over a year ago I did quite a bit of research to make sure I got exactly what I wanted which included being about to provide internet access to my laptop via Bluetooth from my cell phone. The other day I noticed that T-Mobile dropped the price of the total internet add on service down to $20 and decided to go ahead and add this feature to my plan. I originally setup the internet connection sharing to my laptop using the usb cable which provided me with a connection speed of about 385kbps, but tonight when I went to get my laptop setup I remembered that the usb cable was sitting at home on my coffee table. 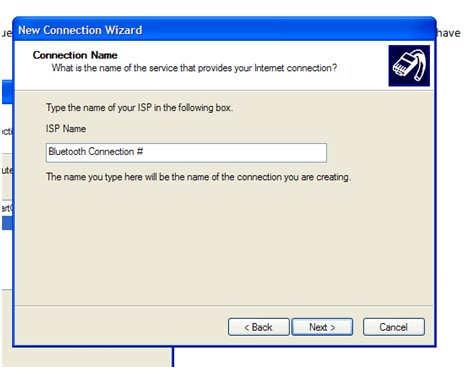 After a few minutes of cursing myself and rechecking my bag I fired up the browser on the phone and Googled the steps needed to setup the internet connection sharing via Bluetooth and now I'm connected to the internet at a whopping 115.2kps. At least it is faster than dialup! I wanted to go ahead and post the steps need to get you going so here goes. 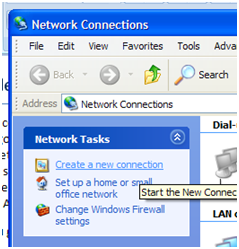 Select Create a new connection from the network connections window. 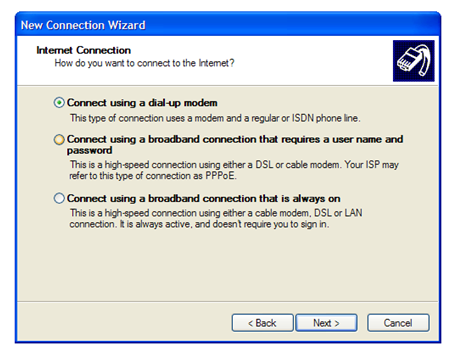 Select Connect to the Internet. 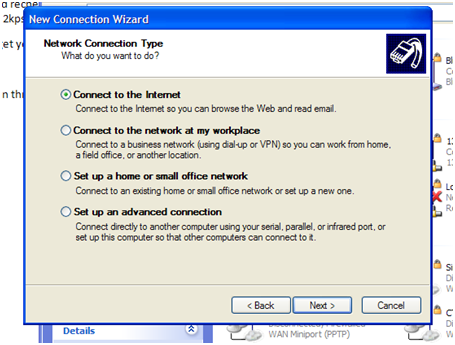 Select Setup my connection manually. 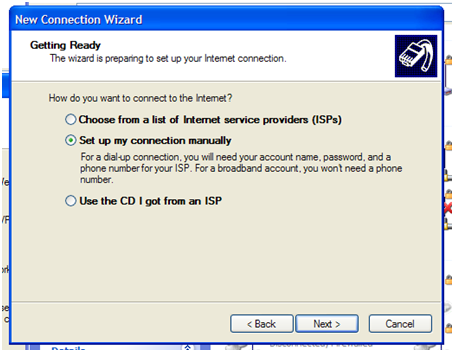 Select Connect using a dial-up modem. Check you Bluetooth modem. For me it is the Bluetooth Modem (COM8). I believe this is automatically showing up for me because I have connected to my phone before to discover services and run ActiveSync. 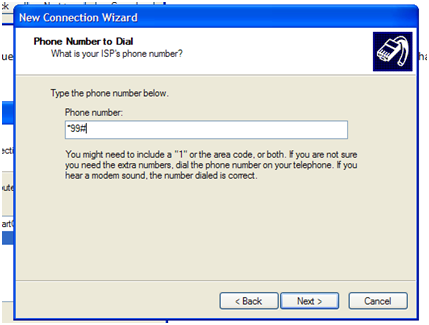 Enter your ISP's phone number. For T-Mobile this is *99# . 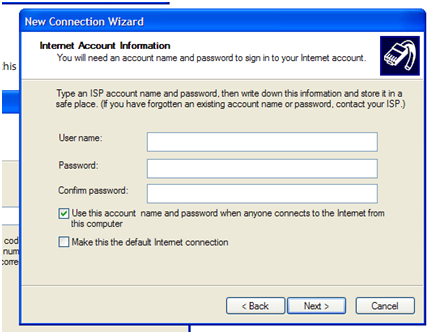 Leave Username and password blank and uncheck the box next to Make this the default Internet connection. Click next and then click finish. 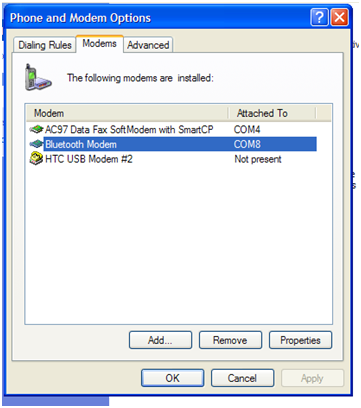 You are about set, but there are a couple more modem configuration changes you need to make. 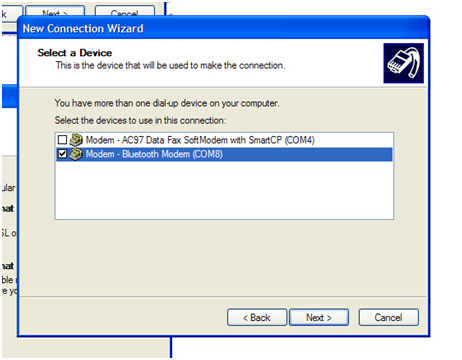 Go to Start -> Settings -> Control Panel and double click on Phone and Modem Options. 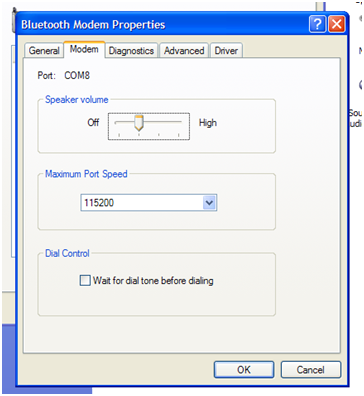 Select the Bluetooth Modem and click properties. Next, uncheck the Wait for dial tone before dialing box. Finally go to the advance tab and enter AT+cgdcont=1,"IP","internet2.voicestream.com","",0,0 into the Extra initialization commands box. All you have left to do is to pair up you phone and laptop through My Bluetooth Places and then go to your network connections and connect through this new connection. Hopefully if you've done everything correctly and I've explained everything correctly then you'll be surfing the web via Bluetooth on your cell phone. Since the usb connection is about three times faster I plan to use that in the future so I will post the instructions on how to set that up sometime as it is a bit different. I'm sure I'll still be using the Bluetooth connection often though as it is pretty easy to forget that darn usb cord.